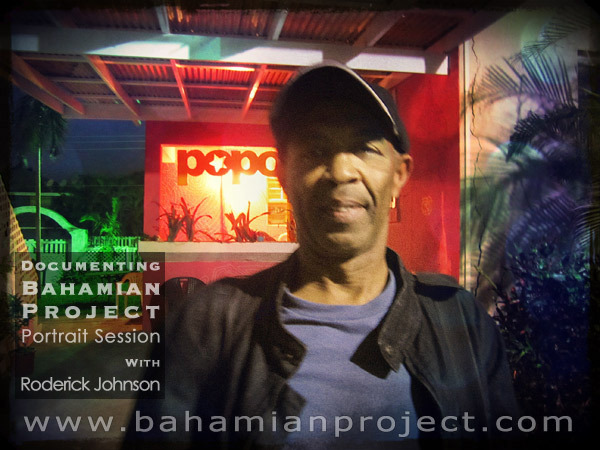 This picture of Roderick Johnson was taken right after his portrait session for the Bahamian Project. The final portrait images will be unveiled at the Exhibition Opening at the National Art Gallery of The Bahamas on July 11, 2013. We asked Roderick to assume a simple dancer’s pose for his portrait… in a very precise and fluid motion he shifted into a strong, graceful position. In that one movement he demonstrated the remarkable control he has over his body as he created a perfect dancer’s form. Roderick has been dancing for decades – he is a versatile artist of dance who has studied, and is able to perform, teach and choreograph in several dance styles. Roderick has extensive professional teaching experience. He holds a Bachelor of Arts degree in Dance Teaching/Therapy, a diploma in Dance Teaching from Ryerson Polytechnical Institute (Canadian College of Dance), and has studied Advanced Ballet at the Royal Academy of Dancing where he was highly commended. He trained at the Joffrey Ballet School and Company in New York in 1977. He became an instructor at the Opera Atelier Dance School of Toronto in 1987, and has been on the faculty of many esteemed universities and colleges. He is the first Bahamian to earn a Master in Fine Arts in the discipline of dance. Through his notable dance career, Roderick has been afforded the opportunity to travel the world sharing his talent and knowledge while growing through the cultural exchanges. His face and tone become animated as he speaks with enthusiasm of his experiences. He spoke spiritedly of his time in Indonesia where he taught dance to children, teenagers and advanced students at Cecilia Ballet School, Lucy Ballet School and Sumber Cipta Ballet School in Jakarta and Belle Ballet in Surabaya. I continue to follow this project on the website and will make a donation. Very important project and to read about legacy of life on the island is very interesting! I will be returning to Nassau 30 April. We are still making our way through the dozens of suggestions we have received. We intend on getting to everyone who was suggested and approved by the selection committee. But with limited funding we can only photograph a few people per week. Some of the people who have been suggested will not be contacted or photographed until the second year of the three-year project. Particularly the people on the Out Islands, because of the additional costs involved.